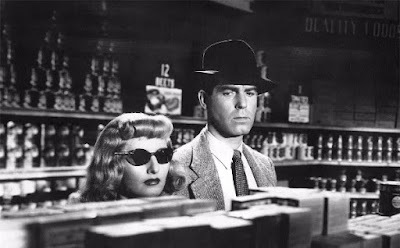 Think of all of the great noirs in one place playing over the course of one five day period and you have the festival. Seriously you get THE MALTESE FALCON, DOUBLE INDEMNITY, LAURA, MURDER MY SWEET and many others all playing at Columbia University. Its so incredible that I know people who are moving into the screening room for the week. Go to your planner, cancel all your plans for the 21st through the 25th then go to the website and look at the schedule and say to hell with it and just buy tickets for everything. Seriously The Kit Film Noir Festival is the best thing you can do in New York. The Boston Underground Film Festival starts Wednesday and runs through the weekend. Its full of great films so just buy a ticket and go. Because of embargos I can't run new reviews until the day of the screenings so don't wait for my word just buy tickets for anything you are interested in. I highly recommend THE THETA GIRL, which is a throw back to weird 1970's drive-in exploitation and TIGERS ARE NOT AFRAID which is like a Guillermo del Toro film only better. I also recommend REVENGE and one of 2017's very best TOP KNOT DETECTIVE. I'll be reposting reviews before the fest. Basically just go and buy tickets. Queens World Film Festival continues this week and we'll be running more reviews. Other than one film I've loved everything that I've seen so buy some tickets and go. The next few weeks are going to be crazy so if you're looking forward to coverage of inde and festival films this is the place to be. New Directors New Films is coming March 28 to MOMA and Lincoln Center and we'll have a good selection of films covered. The What The Fest March 29 to the IFC Center in Manhattan and assuming this week's nor'easter doesn't wash out the tracks we'll have some reports from the press screenings. Kazuo Miyagawa: Japan’s Greatest Cinematographer is getting a tag team retrospective at The Japan Society and MOMA starting April 12 (with Mizoguchi's A Story From Chikamatsu and Sansho the Bailiff at Film Forum from April 6-12.) Its a killer retrospective with most films playing in each location, however check to be sure. Thanks to JB we'll have a good selection of reviews coming. And complicating everything is the fact that the Tribeca pre-fest screenings start so we'll be distracted from everything else as we wade into the 100 plus features and lord know how many shorts. And on top of the festivals we'll have new release coverage (and the last two episodes of THE ALIENIST) as well.So things are going to be crazy. Trust me when I say we have lots of stuff coming- we do. I've spent a portion of the last three months catching up with older films you probably missed or never heard of which I figured would allow us to coast for a bit, but we've got so much new film and festival coverage coming that I keep pushing the old stuff back with the result that if I stopped reporting today Unseen would run uinto September.